I know this sort of thing can be annoying to some Flayrah readers (or viewers, as is the case here), but it’s been around for a while, and you’ve had plenty of time to make peace with it. Besides, some people like this sort of thing. This is in anticipation of a sequel to last year’s Ursa Major nominated My Little Pony: Equestria Girls (review), titled My Little Pony: Equestria Girls: Rainbow Rocks. It is supposed to gain a theatrical (or at least pseudo-theatrical) release in late September. For those unfamiliar with the character, DJ Pon-E became one of the fan favorite “background” ponies from My Little Pony: Friendship is Magic after a seconds long appearance as a fashion show disc jockey in season one episode “Suited for Success”. 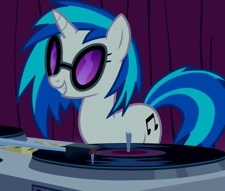 She became popular with the ”brony” fanbase, who gave her the dual names “Vinyl Scratch” and “DJ Pon-E”; the latter has been used in official merchandise. She was one of only two non-speaking characters to receive human version cameos in the first Equestria Girls movie, the other being Derpy. This short is her first starring role. PS: I'm going to pull a Fred here and update in the queue. The second ("Guitar Centered"), third ("Hamstocalypse Now"), fourth ("Pinkie On The One"), fifth ("Player Piano") and sixth ("A Case For The Bass") of a planned seven shorts are up now. I'll ninja update this as more come along. Oops, forgot I was ninja updating this, so Green Reaper ninja edited it for me. Thanks for that. Wow, that was a lot of white people. I really, really hope they don't give her a canon voice.